Hiking up to scenic mountain lakes, having a waterfall completely for yourself or dipping your feet into the cold water at a desolate cove. Water, in all its incredible forms, has a special kind of effect on people. Reason enough for me and my friends to turn our backs on the city again in order to make our way to the wonderful Fuschl am See. And what did we end up finding there? A whole lot of fun, both at and under the water, beautiful, natural landscapes and the fact that we are, in the end, all children at heart. The weekend is finally here! For many years now my group of friends and I have been trying to meet up for a couple of days at least once per year to reminisce about the good old days. This year, we prepared something very special. As per our tradition, we wanted to visit a lake. Hike along the water, jump across streams and perhaps even dare to jump into the cold mountain water. Having picnics at hidden coves, experiencing waterfalls first hand and sensing the true force of nature in the ravines. Just having a great time to remember that we’re all children at heart, after all. And we did end up finding the perfect destination for our journey rather quickly. It was Fuschl am See, a small town by a lake not too far from the city of Salzburg, where we decided to pitch our tents (of course not literally, we don’t want to do without at least a little bit of comfort) and go on excursions within the region. Supposedly, there is a real abundance of small lakes, rivers and streams there. Wait, just a second, someone’s at the door. It’s time to take off. It is beautiful here, I must say. The birds sing and the sun shines through the treetops as we hike and chat toward Eibensee lake, our first destination. Last evening, we had arrived at Fuschl am See, moved into our guesthouse and started our journey by celebrating the reunion over a great meal. Hard to believe how much can change within a single year. After a fantastic breakfast, we arrive on our trail and joyously begin our trip. The trail starts right on the road, leaves civilisation behind rather quickly and passes along one of the streams of the Eibensee lake. We then continue our journey toward the lake across the Wildmoos nature preserve, and, as opposed to what the signage has been telling us (approx. 1.5 h), we arrive after only an hour. Looks like we still got it. The waters are gorgeous and were absolutely worth the short hike. Surrounded by gentle hills and amid the thick forest, one can have a pretty good time here. Comfortably, we relax on a couple of big rocks, dip our feet into the water and have a quick bite to recharge our batteries. If another lake weren’t on our schedule, we could very well spend the entire day right here! Back in the valley, we opt for Wanderweg (hiking trail) no. 40, which sends us pretty far up. If you don’t start sweating at least a little bit here, then you’ve earned my respect. Fiblingsee lake is our next destination, which, supposedly, not only boasts with an untouched natural landscape but also with a particularly gorgeous stage of the “Salzkammergut Bergeseen Trail”. The new long-distance trail connects 35 lakes via a 350-kilometre-long route. Sounds promising. After around 45 minutes (this time exactly in tune with the signage), we arrive at the small but really neat little lake. And it really keeps delivers on all the promises made by the tourist board earlier. Lush flora and fauna, complete seclusion and an incredible scenery in the landscape conservation area have been awaiting us. Back in Fuschl am See, we take our rented bicycles for a tour to Hintersee lake. It’s not very far and so we hop off our bikes rather soon and continue our journey toward the water by foot and with our backpacks on our backs. So that we’re undisturbed, we take the path around the lake and leave the Hirschpoint swimming area behind. It’s a truly beautiful meadow, but we’re here for an adventure, which we find after completing around a third of the way— a gravel bank which drops off flat toward the lake and will be our playground for the day’s last sunny hours. High-spirited, we jump into the water, play a bit of volleyball and have an all-around great time. I wouldn’t mind if tomorrow turned out just as well. 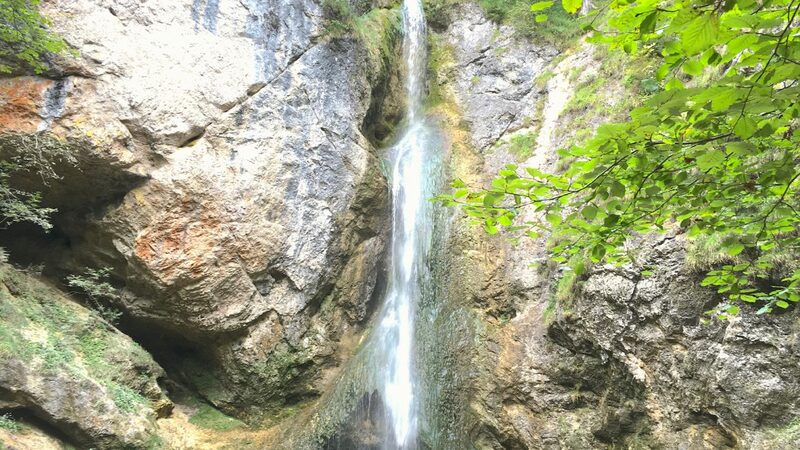 Our first destination is very close to Ebenau and is the Plötz waterfall. We lock our bikes close to the street and start hiking, well, walking upwards for around 15 minutes. First, we pass an old mill, built majestically by a stream, which could very well be a trip destination of its own. But somewhere in the not too far distance we can already hear something roaring and crashing and shortly after we arrive at the mighty waterfall. Could this really be true? Are we really the only ones here? Overwhelmed, we take one picture after another, move closer to the mist until our skin gets wet and take a little dive in the knee-deep water. After approximately one hour, we manage to leave this extraordinary place behind, march back to our bikes and jump on our saddles. Next destination (drum roll): the famous Felsenbad. Do you know that feeling? You are imagining what a place looks like, and when you finally see it in real life, you’re a little disappointed? It’s exactly the other way around with the Felsenbad. I did, of course, look at a few of pictures of the rugged ravine in advance, but I was not prepared for what I actually got to experience, and to be completely frank, I was left a little speechless. But I will try to put it into words anyway. Imagine a place where water and stone crash into one another. Where the earth seems to break open to reveal its inner beauty. Forget it, words fail this place. You simply must see the Felsenbad in person. 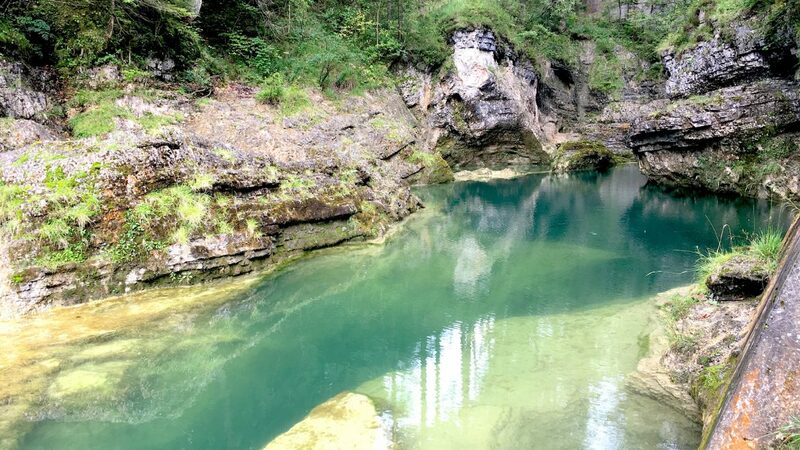 The people here are lying in the sun, cooling themselves in the natural tubs, enjoying a picnic by the water or swimming through the pond that concludes the Felsenbad.